It’s one of my favorite times of the year when we host our Annual Holiday Party for some of our local friends before the Christmas Holidays! We’ve been known to serve a large spread of different types of dishes, all homemade, and delicious (based on the lack of leftovers). Our past menus include make-your-own pizza, Italian pastas with different types of sauces, and Mexican food. But for the past few years, we have found ourselves wanting to serve an assortment of bite-sized appetizers, from simple ones to more extravagant, light and refreshing to more filling, sweet and savory, and various types of cuisines. We found that not only do we enjoy serving and making this type of menu, but our friends seem to enjoy the huge spread of bites coming out continuously throughout the night. It makes for the perfect informal, fun, casual setting where we can really enjoy the food and company. The perfect Holiday Party! Sweet Chili Lime Tofu. After preparing dish, serve each cube of tofu with a toothpick sitting on a platter containing the sauce for dipping. Corn Toast. Served on small bite-sized french bread slices and topped with hot sauce. Italian Samosa. Recipe courtesy of my mom and hoping to make it’s way onto my blog soon. Served with some sweet chili hot sauce. Roasted Cauliflower Drizzled with Tahini Sauce. One of my favorite new recipes. Gotta get those veggies in! Mini Toastadas. Simply find mini toastada shells or your favorite yellow corn round tortilla chips. Spread some Fire-Roasted Black Beans courtesy of Vegetarian Times, and top with chopped green onions and tomatoes. These beans are my absolute favorite…so flavorful that you really don’t need anything else to go with them. Endive boats with Oranges, Goat Cheese, & Almonds. Recipe courtesy of Smitten Kitchen. I was planning on making Pear Feta Endive Bites, but saw this new recipe from Smitten Kitchen in my inbox and immediately switched because of all the awesome flavors she has combined! Veggie Cream Cheese Rolls w/Chunky Tomato Salsa. These are a crowd favorite! Recipe for the rolls coming to the blog soon. Pav Vada Sliders. Another family favorite, recipe courtesy of my mom (hoping to post it on my blog soon). I decided to make them into bite sized portions to act as sliders! Herb spiced potato patties coated in spiced chickpea flour, lightly fried, sandwiched between two cocktail size sourdough bread slices that I found at Ralphs, and served with a side of sweet and spicy chili sauce…so good! Fresh Jalapeno Poppers. These are a crowd favorite and have been on my holiday party menu for the past three years. They are gone as soon as I take them out of the oven. Puff Pastry Baked Brie Bites. Recipe courtesy of Joy The Baker. I made these last year (minus the eggs) and they were delicious. We had a few left-overs from last year that I baked for my Dad the following day and he loved them. I put these on the menu again this year in memory of him. Crostini Topped with Goat Cheese & Roasted Peppers. Because who doesn’t like goat cheese and roasted peppers??? Toasted small french slices topped with spreadable goat cheese and roasted red and yellow bell peppers. You can find directions on how to roast bell peppers in this recipe. Cucumber Canape. Recipe courtesy of Two Peas and Their Pod. These looked delicious and so festive that I had to include them. Cheese Platter. Of course, no party is complete without a cheese platter. I love Trader Joe’s when it comes to building a cheese platter. I’m planning on serving some home-grown mejool dates from my in-laws backyard to go along with some of the cheese. Chocolate Covered BonBons. I just came across this recipe on Food52, and they looked simple and tasty. I just finished making 80 mini bonbons with toothpicks attached for quick bite sized portions and they are delicious. I ended up cutting out some of the sugar and butter, but overall they are delicious and were fun to make. Carrot Cake w/Cream Cheese Frosting. A crowd favorite, and added in memory of my Dad. I just finished baking four cakes, making two 2-layer Carrot Cakes with Cream Cheese Frosting, and topped with shredded coconut and walnuts. I can’t wait for everyone to dig into this cake! 13 Items + 2 Desserts…yes my husband and I are a little in over our heads this year, but it’s the Holidays and we love cooking for our friends so why not! A lot of these items above can be prepped and made ahead of time (morning of or day before) and simply assembled, heated, or baked in the oven when the time comes. We typically have the food rolling out a few at a time throughout the night. If you have any questions on how we prepped ahead of time, ask away in the comments section below. Coming up next week – a great Holiday Dinner Recipe and the perfect way to use my Spicy Tomato Sauce recipe from last week! Oh Anjali, You are awesome. Thank you so much for making this vegetarian recipe blog. I've tried Parfait, caperese salad and zucchini boat, they came out very YUMMY! 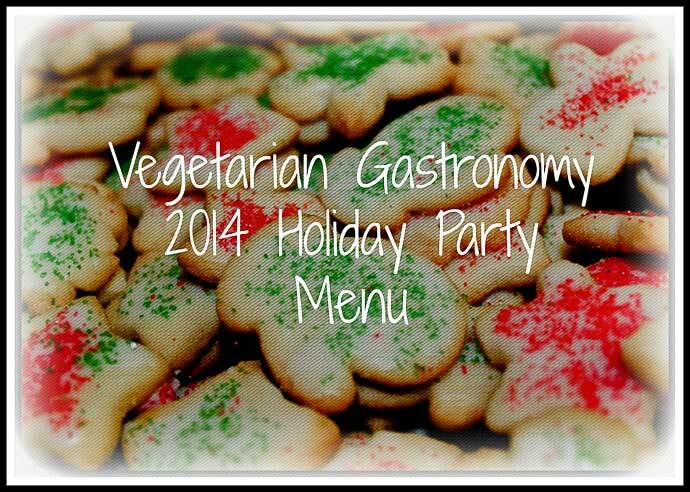 I'm so happy to be the part of you VEGETARIAN GASTRONOMY. You just made my day! Thank you so much for the kind words! !